Photograph collection of webmaster. A nice portrait of 25301 at Speke (? ), date unknown. Built: Beyer Peacock, Manchester, No.8061. Time between last Classified repair and withdrawal: 87 months. The seventeen year seven month career of D7651/25301 was spent allocated to London Midland Region & Scottish depots. October 1972 to Preston Division (D09). December 1976 to Eastfield on loan, made permanent same month. 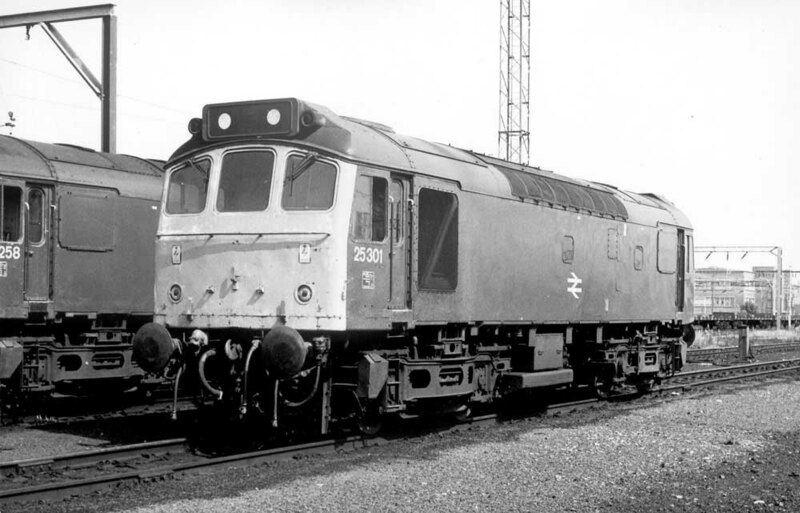 25301 was the 204th Class 25 to be withdrawn, one of six retired during December 1983. After withdrawal 25301 was stored at Bletchley until moved on April 17th 1984 to Swindon Works and broken up there during the middle of August 1984. Noted Derby Works March & April 1972 (dual brake equipment fitted). Noted Derby Works September 1976 (Classified). D7651 was delivered to the Nottingham Division from Beyer Peacock during early May. October 18th saw a Luton - Brighton day excursion have 5213 & 7651 replaced at Acton by 6552 & 6555. May 25th found a Derby - Blackpool excursion in the hands of 5235 & 7651. Working the 6M78 Tyne - Washwood Heath on June 16th were 7518 & 7651. Derby Works was host to 7651 during March and April for a classified repair which included the fitting of dual brake equipment. The locomotive had arrived at Derby Works wearing two-tone green with small yellow warning panels. The Preston Division (D10) received 7651 in October. 25301 was present at Derby Works during September. During December 25301 recieved its only non-LMR allocation, moving to Eastfield for fifteen months. On May 21st the 19.38 Dundee - Glasgow Queen Street was worked by 25301. On June 24th the 04.15 Shrewsbury - Aberystwyth and the 10.07 Aberystwyth - Euston to Wolverhampton were worked by 25301 & 25259. The next day (25th) the 08.45 Birmingham New Street - Barmouth and the 17.45 Barmouth - Euston to Wolverhampton were worked by 25301 & 25259. On July 15th the 07.30 Nottingham - Llandudno Town was worked forward from Derby by 25301, returning to Derby with the 13.02 Llandudno Town - Nottingham. 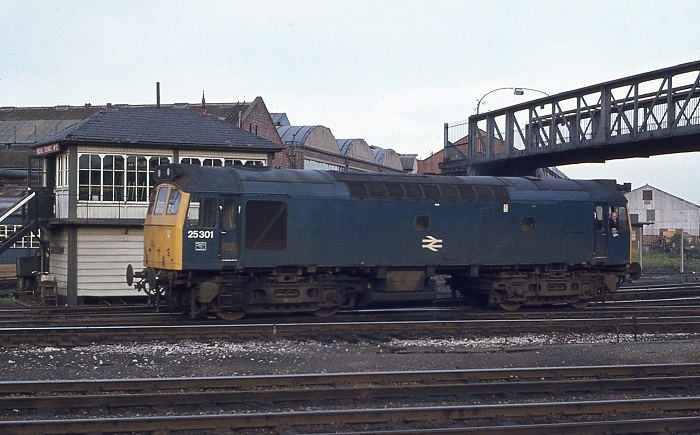 Viewed from platform six at Derby 25301 moves off the fuelling point on July 5th 1978 Photograph collection of webmaster (ADH). Stone traffic from Mountsorrell to Kennett was now handled by new, air braked high capacity wagons. The second trip on October 11th ran behind 25249 & 25301 and twenty four wagons. This same pair were noted on a similar working on October 12th. On February 14th most unusually 25301 was noted at Margam on the 12.29 Swansea - Paddington parcels. The 04.15 Shrewsbury - Aberystwyth and the 10.09 Aberystwyth - Euston to Wolverhampton were hauled by 25301 & 25280 on June 16th. On July 7th the 09.28 Leeds - Morecambe and an unidentified return Morecambe -Leeds were worked by 25301. On February 6th 25301 worked the 16.16 St Pancras - Sheffield forward from Leicester. 25301 was stabled at March depot on March 23rd. The 13.28 Peterborough - Norwich and the return 16.45 Norwich - Peterborough were worked by 25301 on May 31st. The third week of August produced several workings for 25301 over the NE/SW route. On August 22nd the relief 14.34 Wolverhampton - Paignton was worked throughout by 25301 & 25290. The next day (23rd) the relief 14.53 Paignton - Sheffield was forward from Birmingham New Street to Sheffield (?) by 25301. On August 25th the 07.30 Birmingham New Street - Newcastle and the return 13.40 Newcastle - Swansea to Derby were worked by 25301 & 25257, the locomotives were replaced at Derby by 37219. On August 22nd a New Street - Paignton relief was powered by 25301 & 25290. Clearly enjoying its passenger workings it was off in the other direction on August 25th's 07.30 Birmingham - Newcastle and 13.40 return to Swansea, this time with 25301 joined by 25257. This return leg was worked only as far as Derby, 37219 took the train forward. In the March area the Mountsorrel - Kennett stone trains were frequently double headed, so noted were 25301 & 25278 on February 10th & 12th, pairs of Class 31's were also noted on this train. The North Wales coast was host to 25301 on June 23rd when it worked a round trip Manchester Victoria - Bangor, then returning with the 17.42 Manchester Victoria - Llandudno Junction. Three days later (26th) 25301 worked the 11.50 Cardiff - Crewe throughout. Photograph collection of webmaster. 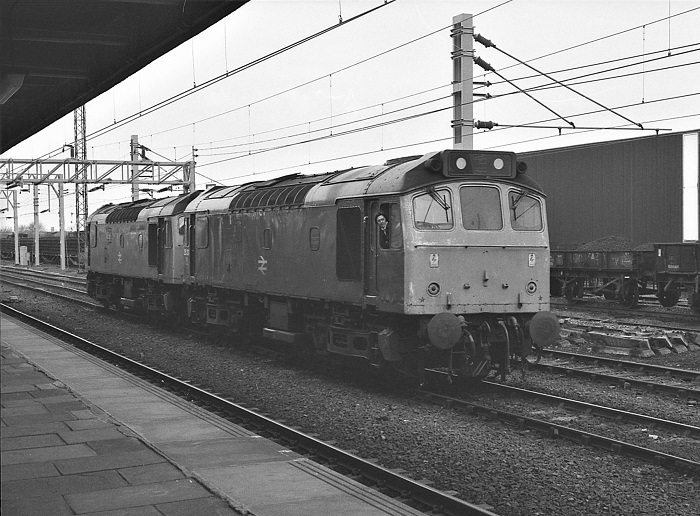 25301 with another Class 25 at Nuneaton, date unknown. Photograph courtesy Tony Sayer. 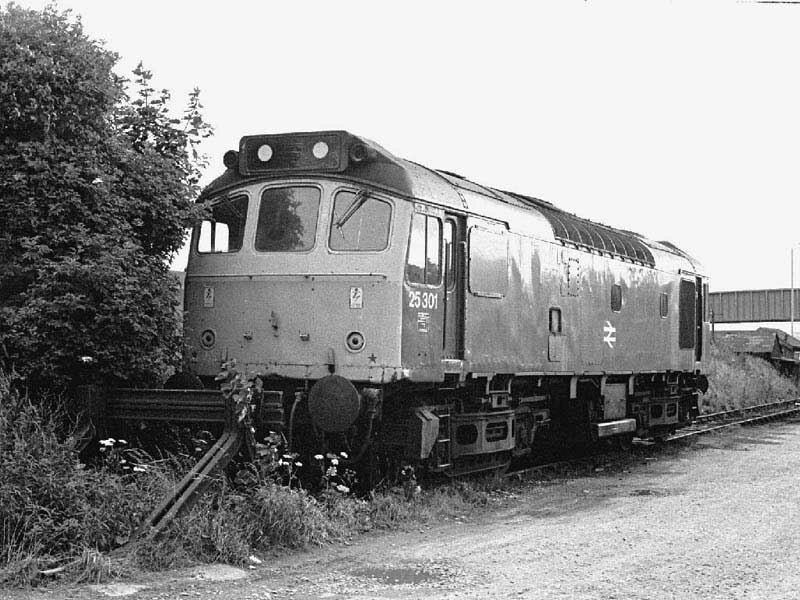 Almost parked in the bushes at the back of Skipton station 25301 takes a siesta on July 26th 1981. 25301 was transferred to Cricklewood during August. 25298 & 25301 worked the 6M35 1315 Exeter - Ellesmere Port empty tar tanks on August 13th. During September 25301 received an 'E' exam at Crewe. On November 1st 25301 & 25242 were noted at Bedford with a brakevan. On January (maybe February) 11th the 08.15 Inverness - Glasgow Queen Street was worked by 26025 & 25301 throughout, the Class 26 had failed but remained with the train to provide heating. 25301 was noted at Nuneaton station on May 19th. 25301 was stabled at Northampton on June 25th. 25301 was noted shunting parcels stock at Euston on July 28th. 25301 was stabled at Workington station on January 14th and was stabled at March depot on January 30th. During February 25301 was in the Preston area working one passenger trip from Preston to Blackpool on February 11th, 14th & 15th. A Toton - Temple Mills freight was worked by 25301 & 25325 on March 1st. A fourteen hour vigil of movements at St Albans on May 26th revealed just three Class 25's in action, 25283, 25301/316, all on freight workings. Photograph courtesy Ron Kosys. 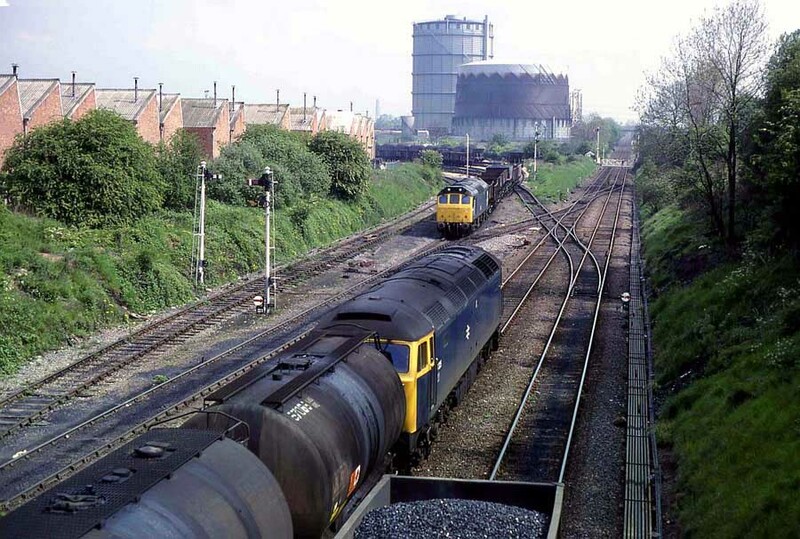 A busy scene at Three Spires on May 26th 1983 looking in the Nuneaton direction. Just visible on the right is the last coal wagon of a train waiting to back into Three Spires yard. In the center is a Class 47 leading a very late running Charringtons oil train bound for Hawkesbury Lane. And to the left in the middle distance is 25301 shunting in the yard. On September 5th 25301 assisted 85018 between Preston & Carnforth on the 21.20 Bristol - Glasgow Central working due to overhead line problems. The next day it worked the 12.40 Carlisle - Glasgow Central - possibly its last passenger working? 25301's last transfer was to Crewe during November, it would be retired the next month, ending her days dumped at Bletchley. 25301 was withdrawn on December 11th 1983. At least one cabside number was saved following scrapping of the locomotive. Page updated January 5th 2019.